Whether you are working online, or offline, Install Manager allows you to manage the products it knows about and check whether they are installed or not. This allows you to quickly see your your content without worrying about spreadsheets, going online and searching your account or digging through your install folders. Knowing what Install Manager has installed, allows the application to quickly uninstall these same files. This process is fast and can be done en mass or individually. One thing to keep in mind when using Install Manager to manage your product files is the fact that it can only manage files that were installed through the application. It will not see or uninstall content that was installed previously via other means and methods. Open Install Manager and navigate to the “Installed” Pane. 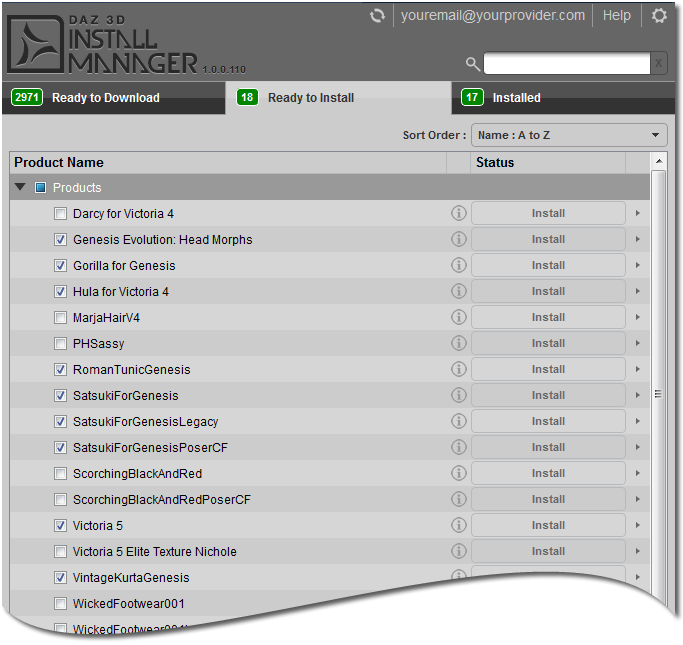 You should see a list of any products you have previously installed using Install Manager. Here in the example, you can see the “Product Name” on the far left. You can also see whether or not it is “Smart” Content (has Metadata), If a product has metadata installed, you will see a check mark under the “Smart” heading. Select “Installation Details” located on the bottom of the window, and expand the detail pane as shown here. This will list things such as Purchase Date, when and which account installed the product, and to what location it was installed. You can quickly verify the information before making your choices, which are detailed in the list below. Uninstall All Files - Check the “Products” box and all your files will be selected under the header. Click “Uninstall All Selected”. 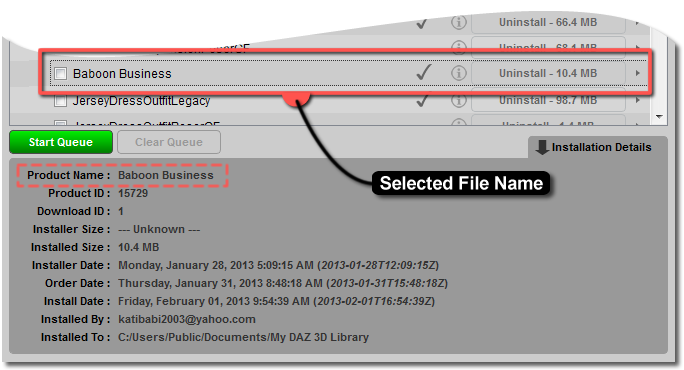 Uninstall Selected Files - This is the same, but instead, individually select the files you want to uninstall. Again, click the “Uninstall All Selected” when you have made your choices. Uninstall One File at a Time - To uninstall a single file in the list, you can click the “Uninstall” button to the right of the file you want to uninstall. Install Date: Recent First - Newest downloaded, in descending order. Install Date: Oldest First - Oldest downloaded, in ascending order.